Clearwater Marine Aquarium is located on beautiful Island Estates, between Clearwater and Clearwater Beach in sunny Florida. This is home to not only Winter the Dolphin, but also to Hope and Nicholas. 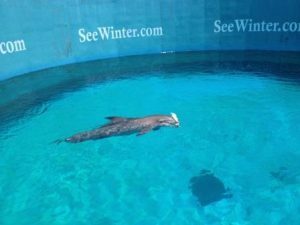 Hope is another female Bottlenose dolphin and she shares the tank with Winter. Nicholas is the resident male dolphin and he is in his own tank. Nicholas was found beached along with his mother when he was a pup. Unfortunately, his mom was so ill that she could not be saved and Nicholas had so much sunburn damage on his back that he cannot be released back into the wild. The sunburn damage comes when dolphins are exposed to the sun through beaching. Their skin is extremely sensitive and can be easily injured. That is why they only roll in the ocean and do not stay on top of the water for very long. This is the perfect way to spend the day, visiting the Clearwater Marine Aquarium and seeing all of the dolphins, sea turtles, river otters, sharks, fish and sting rays that are there. They also offer summer camps for children of all ages, boat cruises to see dolphins in the wild and so much more. Be sure to check the link to their website! This is just one more reason I love living here in the Greater Clearwater Florida Area.